Special Summer Holiday Picture Book Promotion! 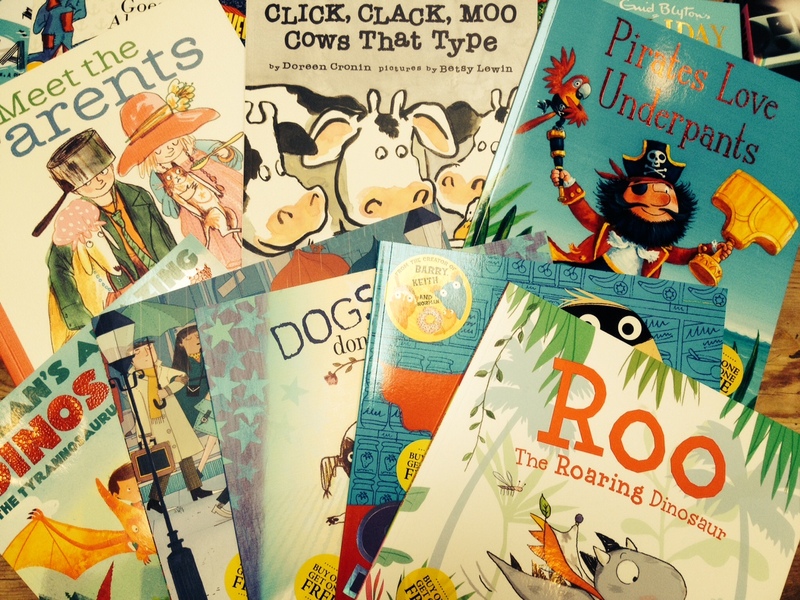 Here are a few of the tempting selection of titles in our big summer picture book buy-one-get-one-free promotion! Featuring fab new titles and old favourites from the good folks at Simon & Schuster, plus a sprinkle of other gems from our shelves. Come on down and grab some bargain story treats for your little people from the spinner at the rear of the children’s area! 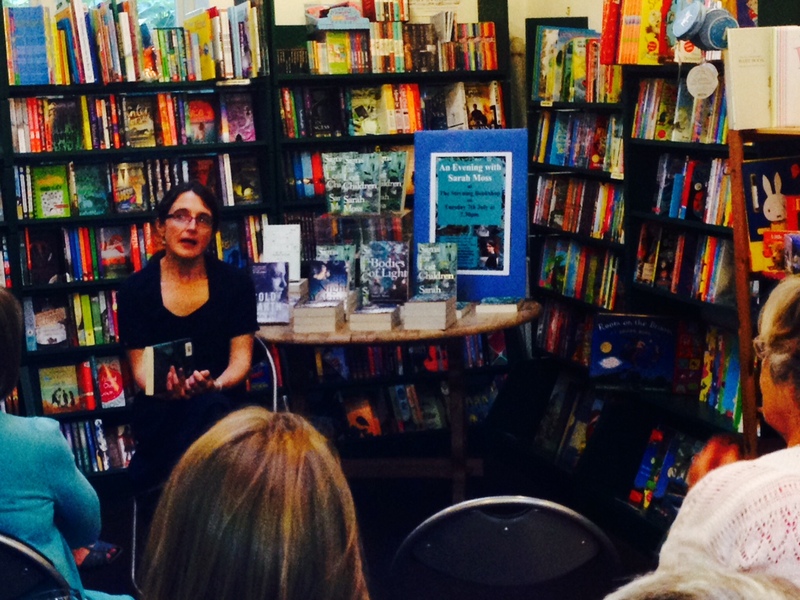 On Tuesday July 7th we felt very privileged to welcome the very talented novelist, travel writer and academic Sarah Moss to the bookshop for an intimate evening event. Sarah proved to be an absolutely fascinating speaker as she took us through her experiences in Iceland, the Hebrides, Cornwall and Japan which have contributed to her novels, and spoke about the themes of female emancipation, madness, philanthropy and the state, mother/daughter relations, and historical fiction which crop up in her latest novel ‘Signs for Lost Children’, published by Granta books. Signed copies of Sarah’s novels are available at the bookshop. 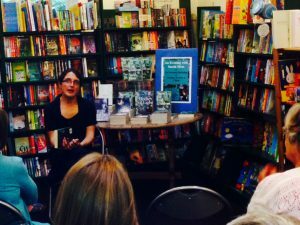 On July 15th local writer Debbie Howells celebrated the launch of her debut thriller ‘The Bones of You’ at The Sussex Produce Café. 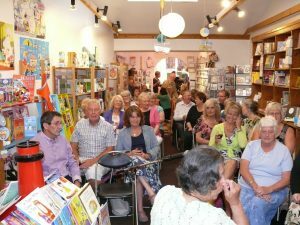 Debbie’s publishers, Pan Macmillan, very generously sponsored the event, which saw a really great crowd (including most of the residents of Debbie’s tiny village, Wiston!) 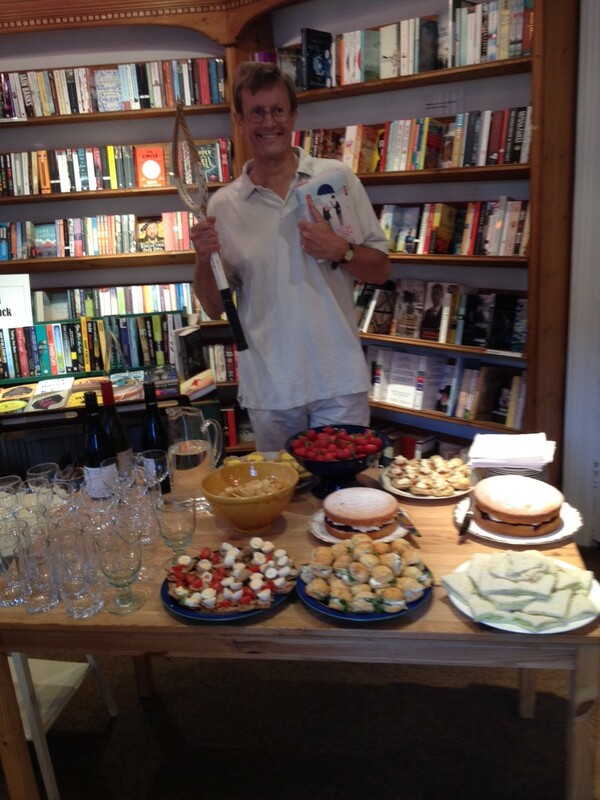 turning out to buy copies of her book and sample the delicious wine and canapés provided by the Sussex Produce Café. The very next day saw Pan Macmillan again showing their generosity by helping us launch Worthing writer Pam Weaver‘s new romantic saga, ‘Blue Moon’. 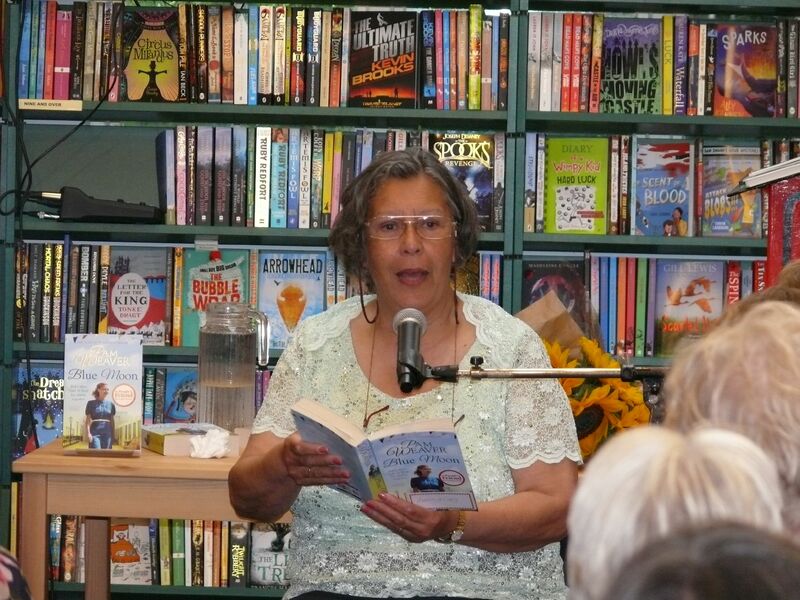 We managed to squeeze around 40 of Pam’s friends, relations and local well-wishers into the bookshop, where Pam amused and inspired us all in equal measure as she described her journey to becoming a published writer and shared readings from her new novel. Sara’s canapés were delectable as always, and we are very grateful to all who came along to celebrate with Pam. Then on July 23rd a friendly crowd squeezed into the bookshop for the launch of Guardian journalist and writer David Boyle’s new book ‘How to be English’, published by Vintage. David Boyle and lots of English delicacies! 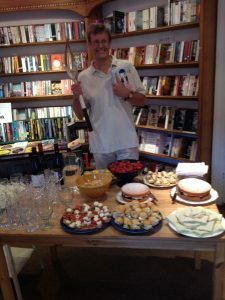 Pictured above, David poses behind the mouth-watering array of British delicacies prepared by his wife Sarah, and by Sara and Alice from the bookshop. An evening of lively debate followed, as David pondered the essence of Englishness (as opposed to Britishness), with plenty of contributions from the audience! We look forward to welcoming David back soon for another informative talk. 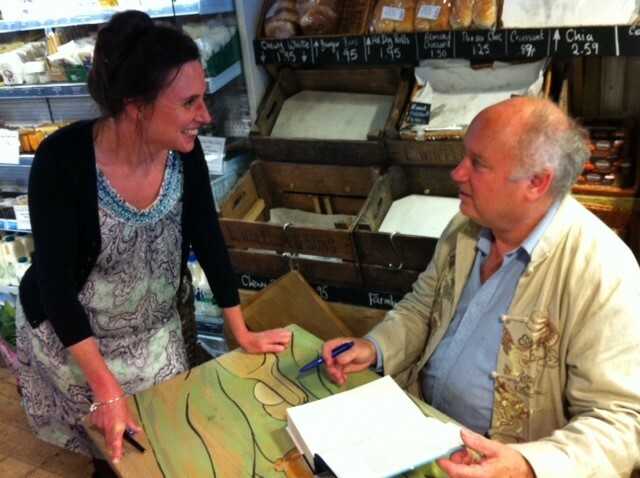 Our second-to-last July event was the eagerly-awaited return of novelist Louis de Bernieres, who joined us for a wonderful author supper at The Sussex Produce Café on July 28th. As ever, Louis was an engaging and amusing speaker, as he regaled us with tales of his grandmother and her lost love, the inspiration behind his latest novel ‘The Dust that Falls from Dreams’ – interestingly, Louis informed us that the book’s title was taken from a song by Louis’ friend, folk song-writer Ralph McTell, in return for a pint! 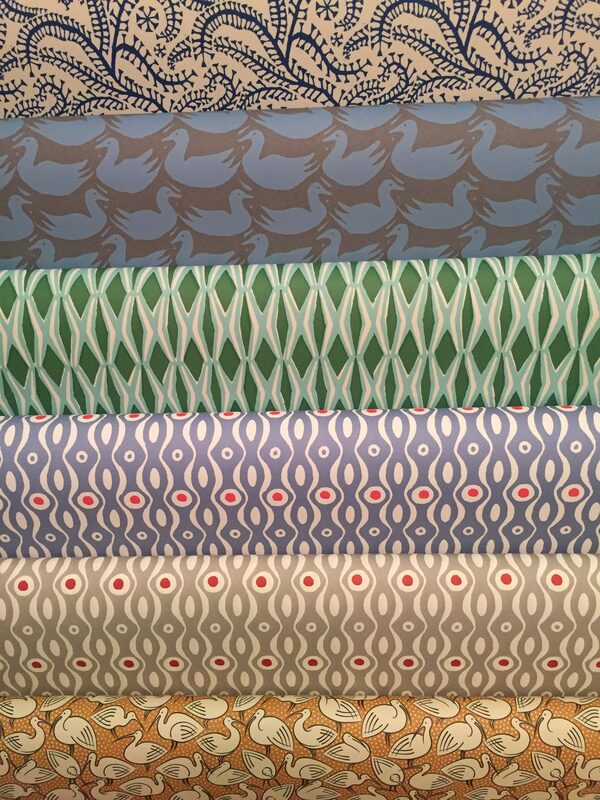 For those who missed out, we have signed copies of Louis’ books in the shop. Many thanks to Louis for coming all the way from Norfolk, and to the Sussex Produce Café for a fantastic menu and great atmosphere, as always! Sadly, despite there being four bookshop staff members present, we were all so swept up in the excitement of the evening that we forgot to take any photos, so thanks to Nick Hempleman from Sussex Produce for this shot of Louis. Finally, on Friday 31st the bookshop garden marquee was hastily erected for Leigh Hodgkinson’s visit. Leigh enchanted the young audience with her story ‘The Monster Snorey Book’ and went on to produce a collaborative giant monster doodle, before everyone got busy creating their very own paper-bag monster costumes, with the usual amount of chaos and glitter-strewing ensuing. Thanks to Leigh, her husband, and 2 lovely children for coming over on such a hot day! 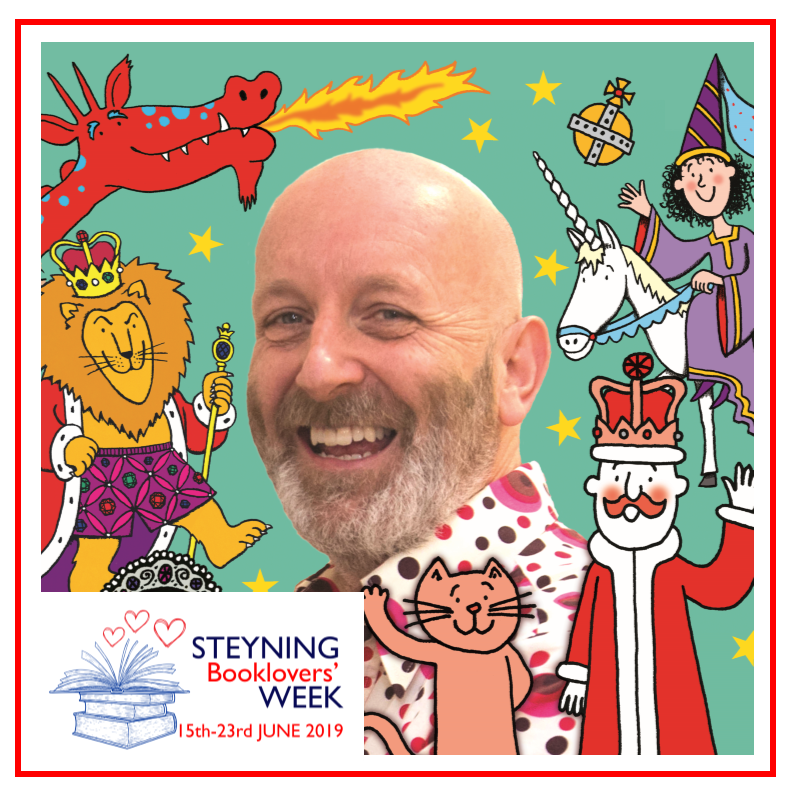 A really enjoyable event, we hope, for all concerned, and Leigh’s vibrant picture books really are delightful, so we hope to welcome her back in future. Lots of pictures from this event will be available to view soon from the Gallery area of our website.